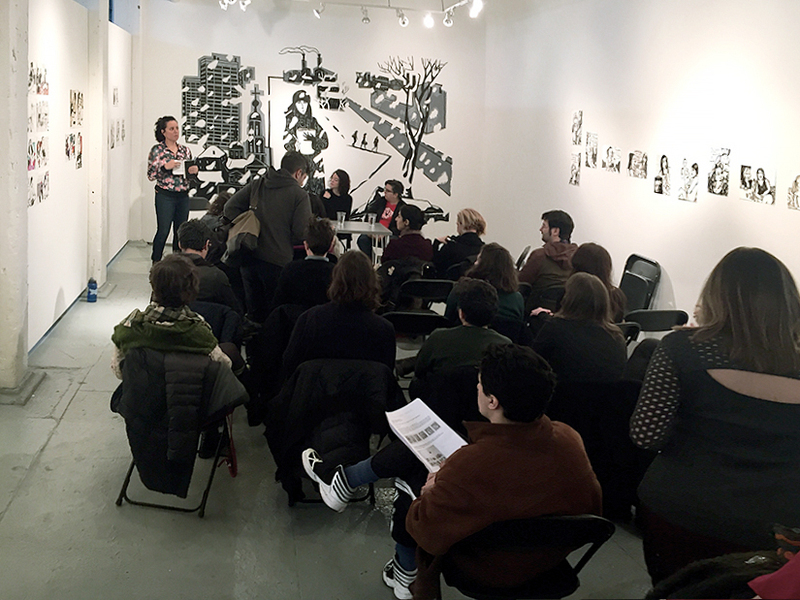 On the occasion of Victoria Lomasko’s first American solo show, Unwanted Women, Ortega y Gasset is proud to present WOMEN-ARTISTS-ACTIVISTS, a panel of graphic artists working to promote social awareness and instigate change. The panel features artists Julia Alekseyeva, Rosanna Bruno and Molly Crabapple in conversation with writer Sophie Pinkham. Please join us at 3:30 PM for a walk-through of Victoria Lomasko’s Unwanted Women, led by Leeza Meksin and Bela Shayevich, followed by the panel at 5 PM. Also on view in our project space, The Skirt, is Phoebe Grip’s Lay, Weight, a site-specific installation of hand-woven traps that explores themes of predation, space and gender. Julia Alekseyeva is the author-illustrator of the graphic novel Soviet Daughter: A Graphic Revolution (Microcosm, 2017). She is also serving as adjunct professor of Cinema Studies at Brooklyn College, and is finishing a PhD at Harvard University. Rosanna Bruno makes paintings and cartoons and sometimes, a mess. Her first book: The Slanted Life of Emily Dickinson was published in 2017. Her work has been exhibited in various galleries and featured in such publications as Bomb, The Daily Beast and Huffington Post, Modern Painters, among others. She received a New York Foundation for the Arts Grant in painting in 2012. Molly Crabapple is an artist, journalist, and author of the memoir, Drawing Blood. Called “An emblem of the way art can break out of the gilded gallery” by the New Republic, she has drawn in and reported from Guantanamo Bay, Abu Dhabi’s migrant labor camps, and in Syria, Lebanon, Gaza, the West Bank, and Iraqi Kurdistan. Crabapple is a contributing editor for VICE, and has written for publications including The New York Times, Paris Review, and Vanity Fair. Her work is in the permanent collection of the Museum of Modern Art. Sophie Pinkham writes literary nonfiction and cultural criticism, with a focus on Russia and Ukraine. She is the author of Black Square: Adventures in Post-Soviet Ukraine (W.W. Norton, 2016). Her work has appeared in the New York Times, n+1, the London Review of Books, Bookforum, and BOMB, among other publications. She lives in New York. Victoria Lomasko was born in Serpukhov, Russia in 1978. She works as a graphic artist and has lectured and written widely on graphic reportage. Lomasko is the coauthor of Forbidden Art, which was nominated for the Kandinsky Prize in 2010. She has also co-curated two major art exhibitions: The Feminist Pencil and Drawing the Court. Her work has been exhibited in Germany, France, Poland, the Netherlands, Sweden, Lebanon, Austria, Belarus, Ukraine and the U.S. Her series have been translated into English, German, and French, and her 2011 graphic novel Forbidden Art was published in German translation in 2013. Other Russias (n+1, 2017) is the first anthology of her work, collecting series from 2009-2016. She lives in Moscow. Phoebe Grip lives and works in Brooklyn, NY. Grip has most recently exhibited at BRIC House for the 2016 Biennial, Re: Art Show in the Pfizer building, and the Wassaic Project’s Summer exhibition Appetite for Destruction. She has been awarded residencies and fellowships at the Vermont Studio Center, The Lehrman Trust at Soaring Gardens, and The Wassaic Project. Grip has a BA in English from Colorado College. Leeza Meksin is a New York-based interdisciplinary artist working in painting, installation, public art and multiples. Born in the Soviet Union, she immigrated to the USA with her family in 1989. Meksin has created site-specific installations for The Utah Museum of Contemporary Art (2016), The Kitchen, NYC (2015), BRIC Media Arts, Brooklyn (2015) and Brandeis University, Waltham (2014). She is the recipient of the Rema Hort Mann Foundation grant (2015) and in 2013 co-founded Ortega y Gasset Projects. She teaches at Columbia University’s School of the Arts and is currently exhibiting her work in a solo show at Miller Contemporary NY, NY. Bela Shayevich is a Soviet-American artist and translator. Her published books include Svetlana Alexievich’s Secondhand Time and Vsevolod Nekrasov’s I Live I See, co-translated with Ainsley Morse.